Home » Our Blog » Frameless Glass Shower Doors » Are Frameless Shower Doors a Good Choice for You? Frameless shower doors made of clear glass are perhaps one of the most popular bathroom enhancements of 2016. Clear glass gives a streamlined, no frills aesthetic to bathrooms that appeals to those looking for a sleek, modern look. Frameless shower doors have many benefits, whether you are installing a new bathroom or remodeling an existing one. The most obvious advantage is the visual enhancement. This style of door gives a room an ultramodern and minimalist feel. Unlike traditional doors, the glass is thicker and does not need a vertical frame for support. This focuses attention on the beauty of your tile and other design features. Additionally, these doors provide more design flexibility when coordinating plumbing fixtures and defining shower heights. Less overall maintenance is another appeal of Atlanta frameless shower doors. The glass fits snugly to your tile or shower bottom, which eliminates the need for a metal track. Although seemingly minute, those metal tracks require regular cleanings, so their absence means there is one less part of your bathroom to clean. Some frameless shower doors use hinges that allow the door to open into and out of the shower. This adds design flexibility for small bathrooms and frees up space normally reserved for door swing. The option to pull the door into the shower could mean a drier bathroom floor and a bit of extra privacy. 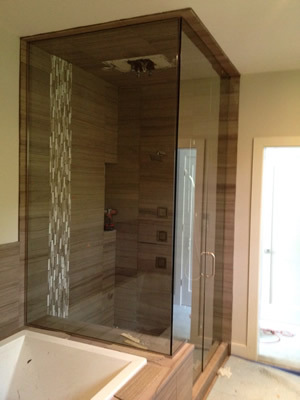 Frameless glass shower doors provide a clean, modern look to any bathroom remodeling project. The first step is to decide if you need new doors or an entirely new shower. Upon removing existing shower doors, you may see holes from wall fasteners or residue buildup where the doors once were. Thorough cleaning and sealant or grout may be enough to use your existing shower. Frameless door construction is of particular importance as the hardware must be able to support the added weight. Doors installed with glass clamps are usually preferred over the U channel method. Glass clamps are typically more expensive, but they substantially increase durability and support. It is also important to think about the best hardware material for your space. There are many options for quality hardware. One of the best is brass-plated metal. This kind of hardware comes in many options, so you can purchase other accessories to match it. Not only will this kind of hardware provide the necessary strength, matching handles will increase aesthetic uniformity. Don’t choose inferior hardware to save a few pennies. Remember, whatever materials you select can almost always be plated to match your décor. As lifestyles become more frenetic, homeowners want to create an oasis for relaxation. Atlanta Bathrooms now include spa-like amenities, like hot tubs, Jacuzzis, and soaking tubs. More and more homeowners are opting for a modern look. Frameless shower doors complement this growing trend and follow clean, minimalist style preferences. Quality design goes hand-in-hand with this look, as does its durability and easy maintenance. Choose frameless glass shower doors for beauty and easy maintenance.